By Preethi Ranjit in Desktop. Updated on May 15, 2017 . The browser market is bustling with countless desktop and mobile browsers. Opera, Brave, and Vivaldi are not as popular as Firefox or Chrome but they all have been created to satisfy specific user needs. Except when it comes to W3C Specifications, no browser needs to stick to the same features. 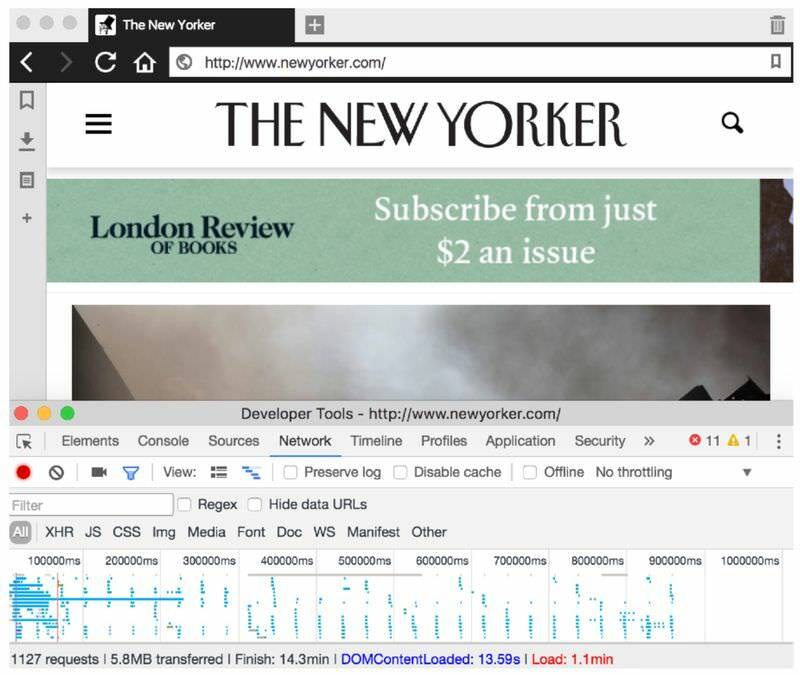 Browser developers make their products stand out by incorporating more and more unique features that are exclusive to that specific browser. In this article, I’ll tell you what makes these three browsers, Opera, Brave and Vivaldi special, and how they perform compared to each other in terms of support, speed, customization, security, unique features, and developer tools. When it comes to cross-platform support, Opera reigns with its wide array of computer and mobile browsers. Brave is pretty close to the top spot with multiple computer and mobile browsers, with only the Windows Phone support missing. Vivaldi, however, is yet to dip its toes in the sea of mobile browsers. Even though there are plenty of mobile browsers to choose from, having the same “brand” across all the platforms is a huge plus—you’ll know all the browser features and familiar with them across all your devices, getting the most use out of them. 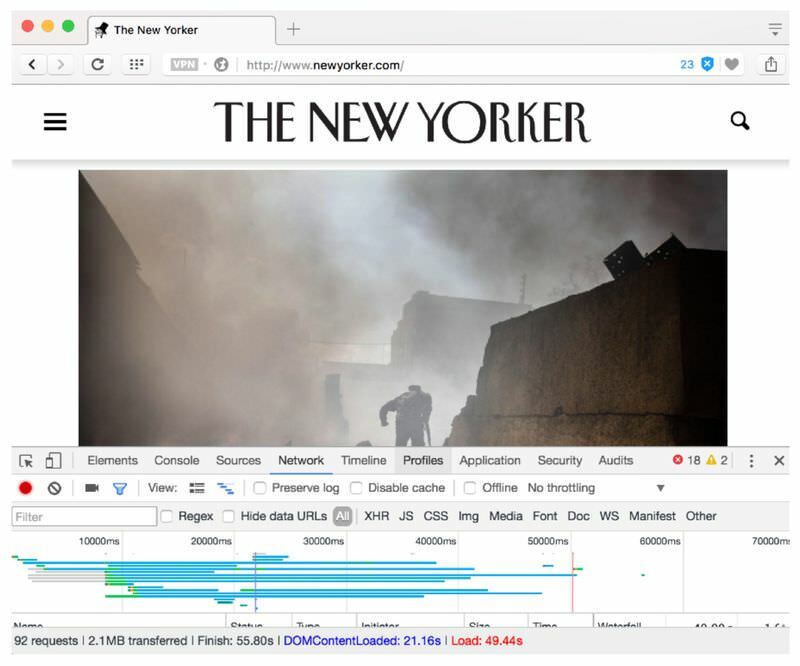 Opera is a fast browser with an in-built adblocker. It’s noticeably faster than Chrome or Firefox with or without the Adblock extension. 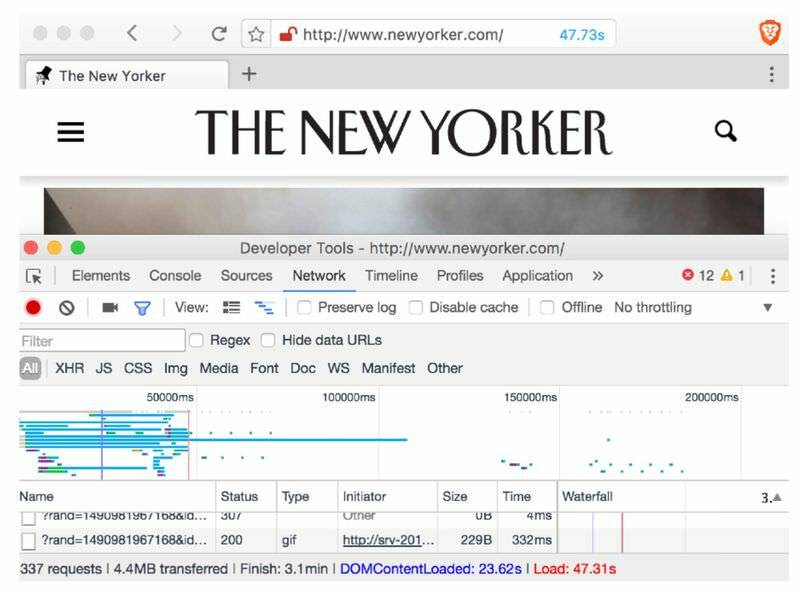 See the Opera network tool screenshot below, you can see a summary of HTTP requests at the bottom for The New Yorker website, to which we’ll compare the other browsers. Brave is most definitely faster than Opera, although the difference is not too noticeable all the time. It also has an in-built adblocker which makes loading of pages much faster. As you can notice on the below screenshot of Brave’s network tool, Brave is just as fast as Opera, and even a little bit faster in loading the whole web page, just in 47.31s. Vivaldi is the slowest of the bunch. Without any built-in adblocker, Vivaldi downloads a high number of resources, slowing down the load time. 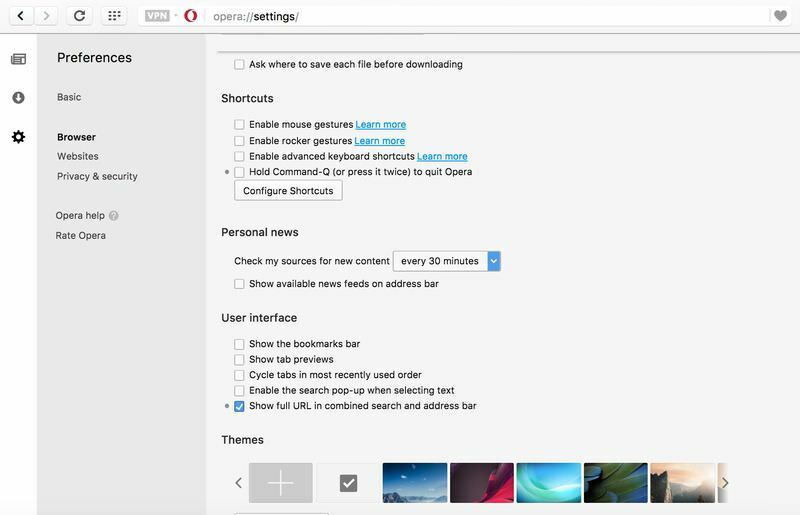 Opera has a mix of standard and vogue customization options: background image for new tabs (called “Themes”), mouse gestures, rocker gestures, advanced keyboard shortcuts, tab previews, and speed dial (a group of favourite websites on the start page). You can reach Opera’s customization options under the “Browser” menu on the Settings page at the opera://settings URL. In Brave, you can have tab sets (n number tabs per set∕group), tabs colored in the theme color of the web page, and tab previews. 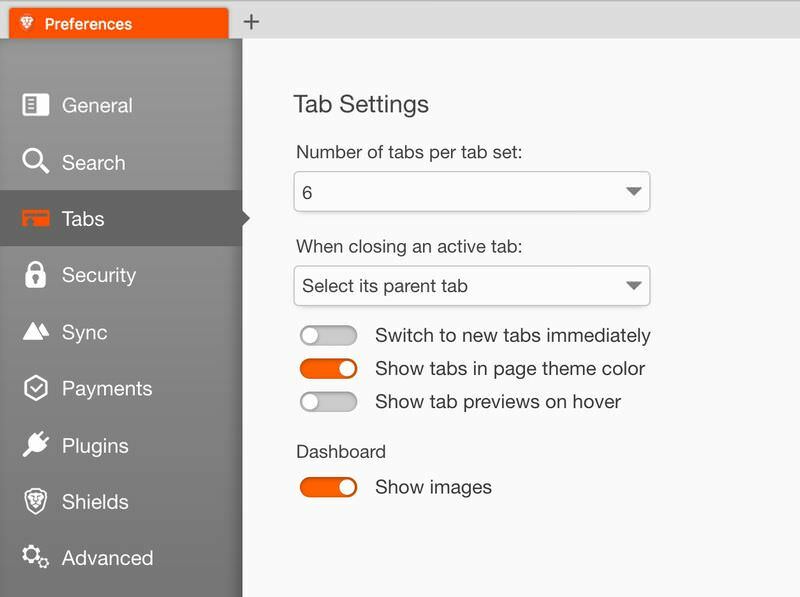 There aren’t really many browser customizations allowed in Brave. On the screenshot below, you can see a Brave tab colored in black for dribbble.com. 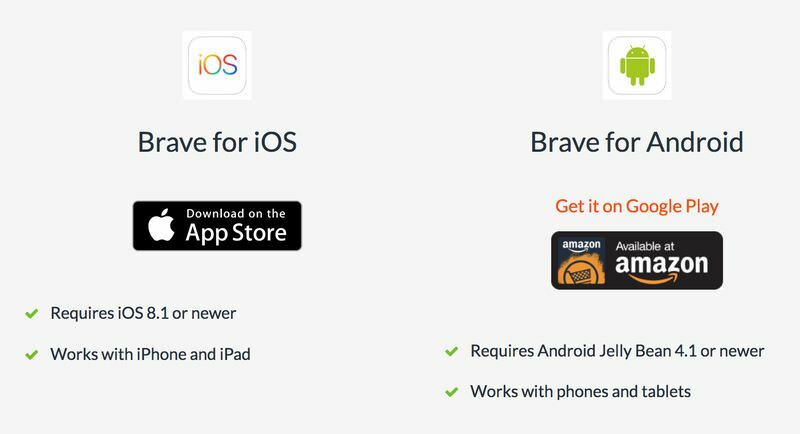 Brave’s options can be found on the Preferences page at about:preferences. Hands down, Vivaldi is the most customizable. Even though Opera shares some design elements with Vivaldi, Vivaldi still comes off better. 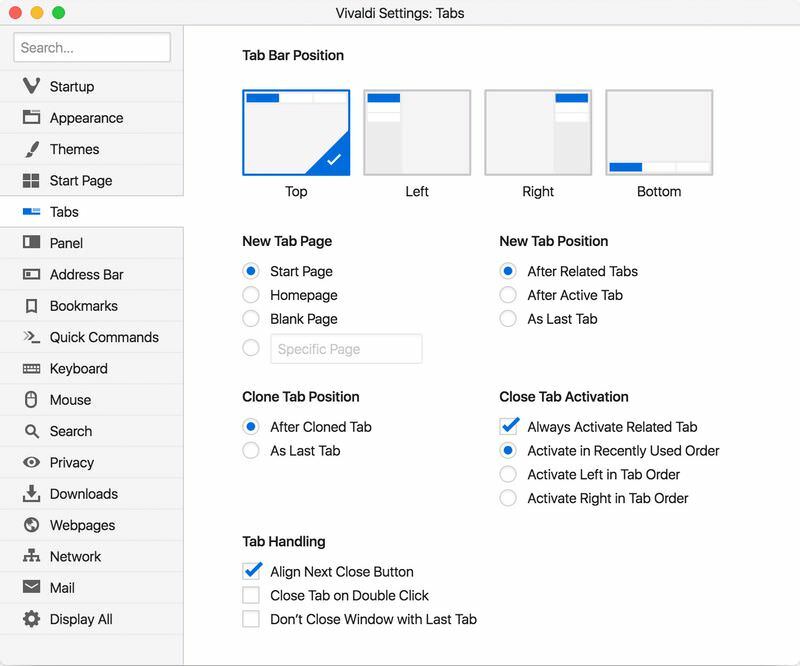 There are highly customizable tab positioning options in its Tab settings, you can go crazy with multiple tabs using tab stacking, and the themes are actually themes that affect the colors of the UI, not just the background image of the new tabs. The “Settings” window (at URL vivaldi://settings/) is also neatly designed and organized in Vivaldi, which makes it much easier to find a setting than in any other browser. As I mentioned before, Opera has an in-built adblocker which is one of the main reason why it’s so fast. But, it also protects you from adware, pop-ups, and trackers. Opera also has a feature that’ll easily pull you its way—free VPN. If you live outside the US you know the struggle for Netflix and such services. VPN solves problem like that and provides an extra layer of security. Usually, you’ll have to go through the hassle of researching and finding a trusted VPN service. Opera is a name well-known and trusted for years, so imagine how great it is to have a free VPN service through their servers. Though Opera and Brave might seem to be on equal footing in terms of security, I’d say Brave trumps in this category. Why? Because Brave does the best tracking prevention! Stopping trackers is a part of the Adblock feature, which generally means stopping ads, trackers, and any other malicious embeds. I noticed that both Opera’s and Brave’s adblocker worked as good as the Adblock extension I use in Firefox, however both extensions and Opera’s adblocker failed to block the trackers my ISP injected. To my surprise, Brave managed to stop these on its own without any custom filter. Brave also has “fingerprinting protection” for touchscreen users. Enough said. 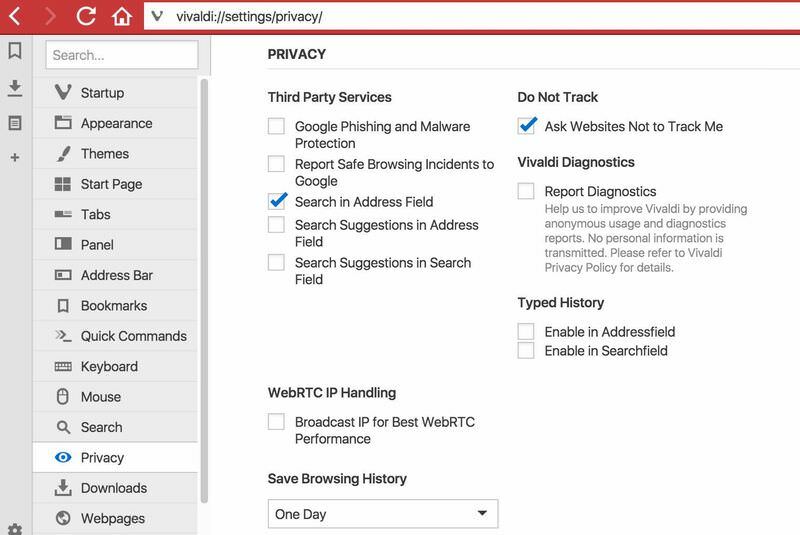 Vivaldi has the usual browser security features such as “Do Not Track”, “Block Pop-ups”, and “Block Cookies”. It also has the third-party Google Phishing and Malware Protection services to protect against suspicious sites. There’s a privacy setting for auto-clearing browser history, useful if you don’t browse in Private mode and want no history. Opera has a currency converter which I’m not sure how many of us would appreciate. Besides VPN, another useful tool Opera has is the personal news feed (these are the kind of things a browser should come with!). The news feed keeps you up-to-date with the latest content published by the websites you have added. 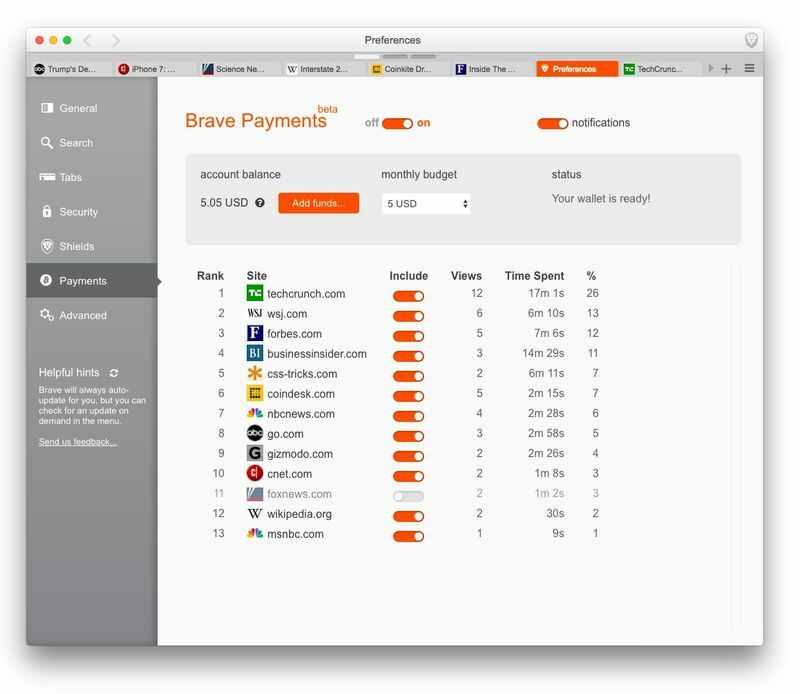 Brave has Brave Payments, an anonymous bitcoin payment system, which is in beta stage. It lets you pay your favourite websites in order to support them. A noble concept, especially since Brave strips their ads off. Vivaldi has the most unique features. Apart from the ones I already mentioned, it has notes, rewind & fast-forward, tab stacks, contrast adjustment, and more. Oh, and it also comes with Philips Hue integration. What’s Philips Hue? It’s the light tech everyone starts their journey to a Smart Home with. Since Opera has been around for a while, its developer tool integration is good, same as Chrome’s but not as good as Firefox’s in my humble opinion. 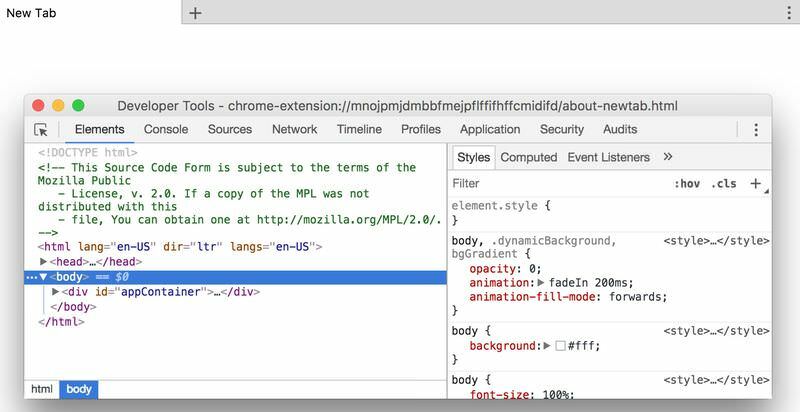 If you have already used Chrome’s devtools then you’re not going to have a beef with this one. 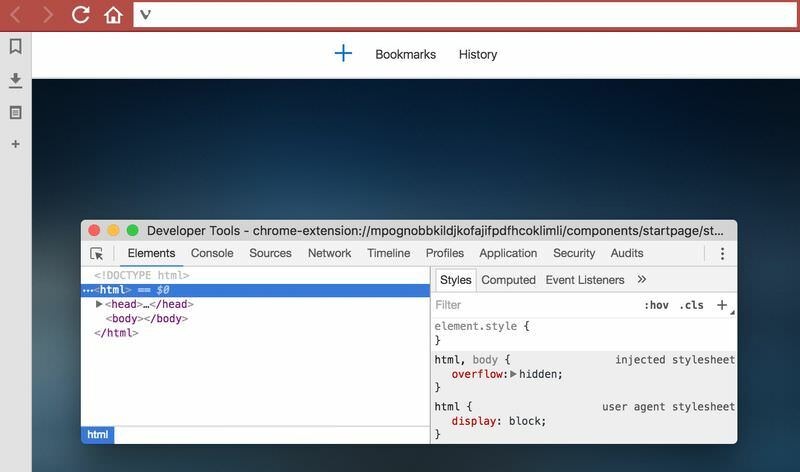 Brave’s devtool integration is not that good, especially as it can only appear as a new window, not as part of the tab where the site resides. Vivaldi is also lacking in the devtool scene – having the same issue as Brave. Developers of these two browsers seem to have just squeezed the devtool utility into the browser software just for the sake of it. The tool also keeps freezing at times. To be honest, I don’t see how Vivaldi or Brave can become the primary browser of a developer. Right off the bat, you’ll notice a major problem (for some of us at least) with the Brave browser i.e. having to download an over 120MB installer file. I understand it’s open source and all, still, this might put someone off from even trying it in their average speed internet. Vivaldi’s installer is around 50MB and Opera’s is 1MB. Another issue (or maybe a blessing in disguise) with Brave is the lack of extension support. The browser comes with a couple of default extensions and you can’t add more to that list unless you are willing to hack your way in. Opera is still an overall good browser compared to the other two (and even Chrome and Firefox), but Brave is becoming more and more my go-to browser next to Firefox, just because of its tight security. I have Opera up and running only when VPN is needed. As for Vivaldi, it doesn’t claim to be the fastest or the most secure browser in the world, so it’s fine that it’s not any of those, especially when it does live up to its promise of great user experience and if you’re worried about security and all, there are always some great extensions to give a try to. Do you use any browsers besides the usual trio of IE, Firefox & Chrome? If so, which one and why do you like it?